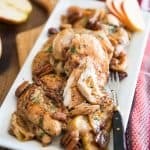 This Sheet Pan Apple Pecan Chicken is so easy to make, you'll want to have it any time of day! Try it in the morning, for a delicious start to your day! The previous night, place your chicken breasts to brine in a solution consisting of 4 cups of water and 2 tablespoons of salt. While this step is not mandatory, it will definitely make your chicken a lot tastier and much juicier, too! Pat the chicken breasts dry, butterfly them if you haven't already done that and arrange them on the baking sheet. Place the apple slices and pecans around the chicken. Combine the melted ghee, honey, Dijon mustard, apple cider vinegar, chopped thyme, salt, chili pepper flakes and ground nutmeg in a small bowl and mix with a whisk or fork until well combined. Pour that over the chicken and apples and rub it well with your fingers. Place in the oven and bake for 25 minutes, or until the chicken registers at least 165°F on a meat thermometer. Toss the ingredients around once or twice during cooking.